This week’s edition focuses on A/V-related news from Microsoft, Logitech, Nureva, InFocus, and Yamaha UC. You may have noticed a lot of audio/video -related news hitting the wires this week. That's, in part, due to the InfoComm A/V conference taking place in Las Vegas. We covered a batch of announcements earlier this week, and have plenty more to share. Let's look now at the latest in A/V from Microsoft, Logitech, Nureva, InFocus, and Yamaha UC. You may be familiar with Microsoft's internally developed Surface Hub and recently unveiled Surface Hub 2 (see more) interactive digital whiteboards, but they aren't the only such collaboration devices Microsoft has in store for you. Microsoft this week announced what it's calling a "new category of teamwork devices," Windows Collaboration Displays. The aim of this portfolio addition is to let meeting participants experience Microsoft 365 collaboration tools like Office, Teams, and Whiteboard on large, interactive displays in room settings. And, for facilities managers, built-in sensors will connect to Azure IoT spatial intelligence capabilities, providing them the ability to make room decisions in real time based on environmental data, Nick Parker, corporate VP of consumer and device sales, wrote in the Official Microsoft Blog. Collaboration display vendor Avocor will be among the first companies to deliver a Windows Collaboration Display, Parker said in his post. The Windows 10-compatible Avocor displays will feature 4K 20-point touch displays for pen and inking functionality, Avocor said in its press release. The Avocor Windows collaboration products will include integrated cameras, stereo speakers, far field microphones, and pens, the company said. Avocor's first Windows Collaboration Displays will be available later this year, as will displays from Sharp, Parker wrote. 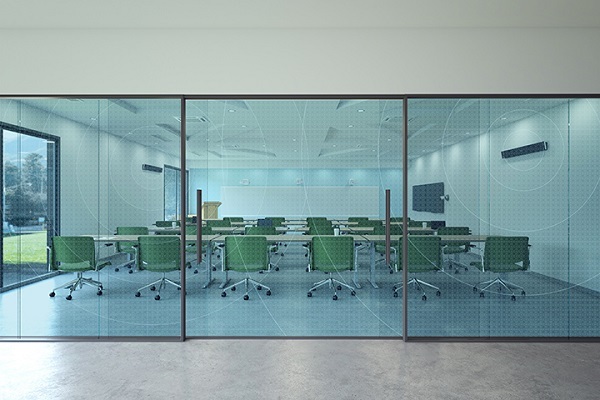 In the first of two announcements, Logitech introduced Rally, a modular conference room solution, shown below. Rally offers premium features such as ultra-HD 4K video, modular audio components, expanded pan/tilt/zoom capabilities, and new intelligent automation technology (more on that in a minute). With Rally, Logitech has rethought the traditional meeting room layout that delivers audio from a centrally located tabletop speakerphone. Instead, with Rally, you can situate the speakers at the front of the room, so the sound comes from the same place as the video display. Further, you can link up to two speakers for larger rooms, as well as wire together up to seven of standalone mic pods. Rally's modularity makes it adaptable for all sizes of rooms and meeting spaces, Joan Vandermate, head of marketing for the Collaboration Business Unit at Logitech, told me in a briefing. Additionally, by separating the speakers from the display, Logitech has been able to better align the audio with the video, she said. To start, Logitech will deliver the Rally camera component later this month, for $1,299. Availability for the rest of the components will follow this fall, with a Rally system comprising the camera, one speaker, and one mic pod, priced at $1,999. A Rally Plus solution, which adds a second speaker and mic pod, will be available for $2,499. Enterprises have the option to expand the system with additional mic pods, priced at $349 apiece. Logitech already includes RightLight and RightSound in numerous conferencing cameras and webcams, including the new Rally system. RightSight will become available later this year via a software download, Logitech said. Nureva made several announcements this past week. First, it introduced a "follow me" feature for its Span Workspace, visual collaboration software that lets team members use their personal devices and Nureva's interactive wall display to contribute and interact with content on a shared "canvas." With the follow-me feature, all participants in a real-time collaboration session get a view of the current presenter's canvas. Next up, Nureva announced the addition of intelligent sound targeting (IST) to its Microphone Mist technology platform that powers the company's HDL300 and Dual HDL300 audio conferencing systems. The patent-pending Microphone Mist technology, shown below, works by filling a meeting room with thousands of virtual microphones for full-room audio coverage. Now with IST, the system will be able to identify and ignore undesirable sound sources, filtering out unwanted background noise, for example. In a third announcement, Nureva introduced its Microphone Mist firmware update, which includes customizable audio settings for toggling between stereo and mono sound and adjusting bass and treble levels; auxiliary audio modes for interoperability with in-room speakers, recording devices, and other third-party systems; and enhancements to audio performance with echo cancellation. HDL300 customers can download an updated version of Nureva Room Manager software to gain these new features. InFocus, a collaboration display provider, showcased a range of new products, including the Mondopad all-in-one line for businesses. Mondopad products feature an updated user interface to facilitate video conferencing and information sharing. The line comprises three models -- Monopad Ultra, Launch, and Access -- each of which will be available in 55-, 65-, 75-, and 86-inch models, in addition to multitouch 4K or 1080p antiglare displays. Mondopad Ultra features interactive digital whiteboarding, native HD video calling, and data sharing; users can view and control the touchscreen display via their personal devices. Mondopad Launch models, aimed at enabling users to start meetings with the tools of their choice and share content from personal devices, feature a built-in Windows PC and an Intel Core i5 processor. Mondopad Access lets users wirelessly share and present content via the InFocus SimpleShare presentation solution. The new Mondopads will be available for purchase later this year, InFocus said. 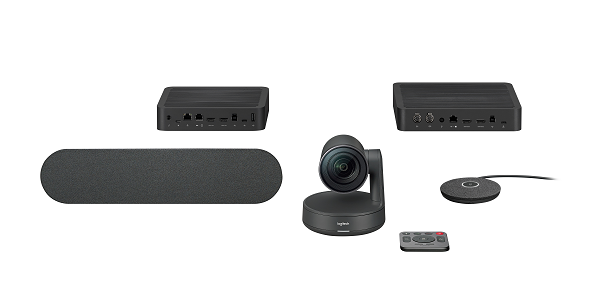 Yamaha UC debuted an audio conferencing solution for use with a variety of communications platforms and designed for out-of-the-box installation in boardrooms and large conference rooms. With the YAI-1 Conference Ensemble, Yahama aims to provide "consistent, professional-grade communication throughout a meeting," said Phil Marechal, VP of business development and product management at the company. This package addresses the audio shortcomings of UC platforms with an eight-channel wireless microphone package, two PoE speaker arrays, a preconfigured digital signal processor, a five-port PoE switch, the Dante AVIO USB adapter, and cabling. It connects via a USB cable to conferencing platforms like Microsoft Skype for Business, Cisco Webex, GoToConference, Zoom, BlueJeans, and Amazon Chime.